When Jamie and Kirsty move into their first home together they are full of optimism. The future, in which they plan to get married and start a family, is bright. The other residents of their building seem friendly too: the horror writer and the middle-aged herbalist who live upstairs, and the Newtons, a married couple who welcome them to the building with open arms. At first, the two couples get on well. But then strange things start to happen. Dead rats are left on their doorstep. They hear disturbing noises, and much worse, in the night. After Jamie’s best friend is injured in a horrific accident, Jamie and Kirsty find themselves targeted by a campaign of terror. 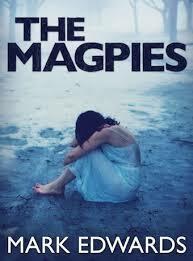 THE MAGPIES is a gripping psychological thriller in which the monsters are not vampires or demons but the people we live next door to. It is a nightmare that could happen to anyone. Any fears about Mark Edwards going solo for this book were quickly put to one side, but they were replaced by all new fears – those of what were certainly looking like becoming the neighbours from hell. The Magpies is a cunningly crafted piece of psychological crime fiction which burrows into the brain with a plentiful supply of ‘what if’ moments that’ll have you concerned about your own closest neighbours, whilst also (hopefully) giving you some assurance that you’re probably much better off than the central characters in this tale. Often with this genre of novel, or indeed film of this type (of which this would make a great one), the tales suffer from those moments where little is happening, when the reader/viewer is left to ponder what the next set piece might be coming along. With The Magpies, Edwards has built the tension and the elements of the unknown sufficiently well enough that, even in those quieter moments, you’ll be clutching your e-reader tightly with concern about just what is to unfold on the next page click. Keep the keys to your home in sight, check your letterbox, monitor your emails – like the best in crime fiction the fact this could happen to any of us will keep those pages turning.